Jonathan Calderon marches to his own beat. It’s a talent that has been a passion, but it wasn’t one he ever imagined would earn him a degree in instrumental performance. In fact, he was unable to participate in bands or orchestra in high school because he didn’t read music. He explains that many drummers study YouTube videos of other drummers and can develop their own rhythm skills. With his home-grown ability, Jonathan auditioned and was admitted to Nyack’s School of Music. And what could be better for him than to be taught and mentored by Prof. Chris Hughes, also a percussionist and someone who has become like an uncle to Jonathan. Like so many students at Nyack, Jonathan has been given an opportunity to fulfill a dream. 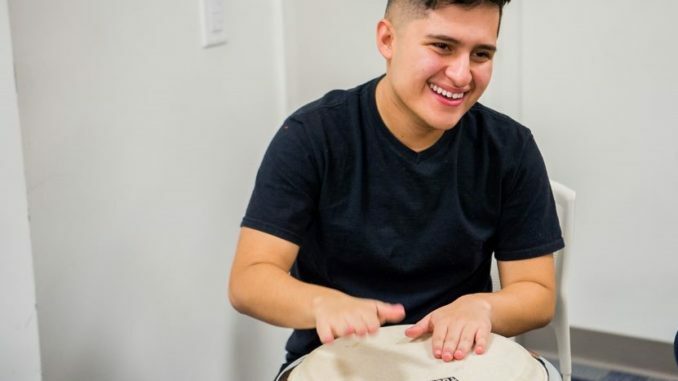 He may not have been qualified to be a drummer in high school, but his talent is a welcome addition to the Nyack College School of Music.